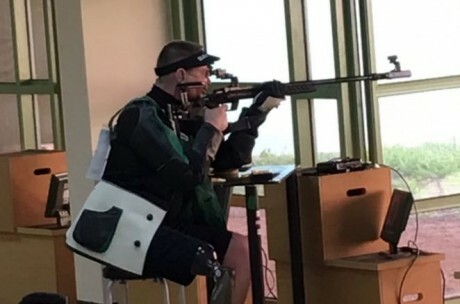 It was a tough day in the desert for Irish shooter Philip Eaglesham, who finished just 2.6 points off the Paralympics MQS (Minimum Qualifying Standard) for Rio after his competition earlier today. Both Eaglesham and Seán Baldwin were competing in the UAE in the IPC Shooting World Cup and with the pressure on, external elements including match conditions proved to be extremely difficult. After achieving a competition Personal Best yesterday, it was Eaglesham who was first up to shoot this morning and finished in 22nd place.Unfortunately though, he fell just short of the Paralympic MQS and he, along with his coaches, will now be looking ahead to the possibility of attending the next IPC Shooting World Cup to be held in Thailand in the coming months. Seán Baldwin meanwhile was next up, shooting later in the afternoon, local time. He finished in 18th position and there were plenty of positives from his performance to build on in the coming months.Today's event was the second event for both shooters.